Kids are typically eating and drinking three times more sugar than they should be; and at Easter time it’s likely this number will be higher. But after the Easter break ends, it is a great time to start thinking about how you could make a difference to your family’s health. Staying physically active helps children to build social skills, improve mental wellbeing and maintain good bone and heart health. Children who achieve a healthy weight tend to be better able to learn and are more self-confident, all fantastic reasons to make 2019 the year your family gets started. With the help of Change4Life here are 9 small suggestions that could make a big, positive difference to your family’s health. Simply choose the easiest one for you and get started today. Food labels can seem a bit boring, but they are the best way of telling you what’s hidden inside your food. A fun and simple way to do this is to use the Be Food Smart app, which allows you to scan food and drink barcodes so you can quickly see what’s inside. You could even turn it into a game and have your little ones guess how many sugar cubes or salt sachets are in their favourite food, you may be surprised by what you find! Less than 23% of all kids are getting the recommended 60 minutes of physical activity they need every day to stay healthy. When it’s cold and wet outside we know this can be easier said than done, but with 10 Minute Shake Ups you can ensure your kids are getting their 60 active minutes whatever the weather. The Shake Ups are a great way to keep your kids entertained with 10 minute bursts of games and activities, featuring their favourite Disney characters. Every 10 minute burst of exercise can make a real difference in helping your kids reach the 60 minutes they need each day. Stuck for healthy recipes ideas? Or got a household of fussy eaters on your hands? Whatever you feel is standing in the way of making tasty healthier meals your whole family will enjoy - don’t worry - the Smart Recipes app is great for mealtime inspiration. Discover over 160 quick and tasty meal ideas and get cooking today. We all know careful planning leads to better performance, and when it comes to our health the same rule applies. If you plan your meals in advance, you’re less likely to eat snacks and convenience food – and more likely to save money too! This year challenge your family to complete the Weekly Meal & Activity Planner. They don’t call Kent the Garden of England for nothing. The rolling hills and downs are enough to entice even the least intrepid explorer to venture out of doors. You could explore one of Kent’s nine beautiful country parks, boasting impressive views, a variety of habitats and family facilities to enjoy. Alternatively, if you need a little more motivation to venture outdoors, the Kent Sport activity finder is also a great tool to find activities, events, clubs and organisations near you. Join the Wright family in taking on the ‘Try Something New’ challenge – simply pick up something new at your next shop, or try a new recipe using food you already have in the cupboard, and have a thumbs up thumbs down taste test vote afterwards! Mixing up mealtimes is a really easy way to keep healthier food exciting, cheaper and hassle-free. Try something new in your kids lunchboxes this week - even if it’s just one day a week – it’s really easy with these menu ideas for all ages. If the snacks are there, we'll eat them! Unfortunately, the ones kids like best are often high in sugar, saturated fat and salt. Over time, too much of these can lead to serious health problems like heart attack, stroke and type 2 diabetes. The truth is, we all probably snack more than we realise. It's so easy to grab a chocolate bar or a bag of crisps if we're hungry, instead of reaching for something healthier, that we don't notice how often we do it. Don't try to cut out the kid's favourite snacks – just ease them, and yourself, in gently and they probably won't even notice. Find more options for healthy snack ideas. Instead of cutting out snacks entirely, another good tip is to stick to just one snack in the morning and one in the afternoon. Don't feel guilty if the kids complain – blame "Max"! 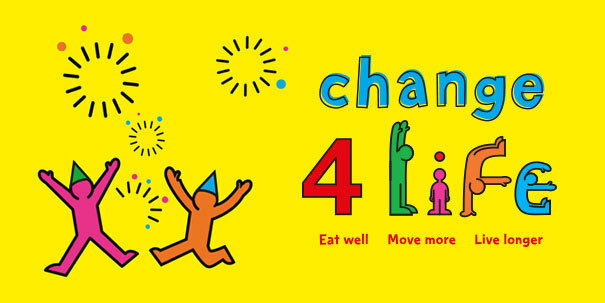 For more fun ideas and simple tips for busy Kent families join the Change4Life Kent community on Facebook.